Say hello to the new Kia Soul from Kendall Kia! This sporty small SUV is fun to drive and has the perfect combination of features to satisfy drivers of all ages. Available in Kia Soul LX, Soul S, Soul GT-Line, Soul X-Line, Soul EX, and Soul GT-Line Turbo trim levels, the new Kia Soul is sleek on the outside and smart on the inside. 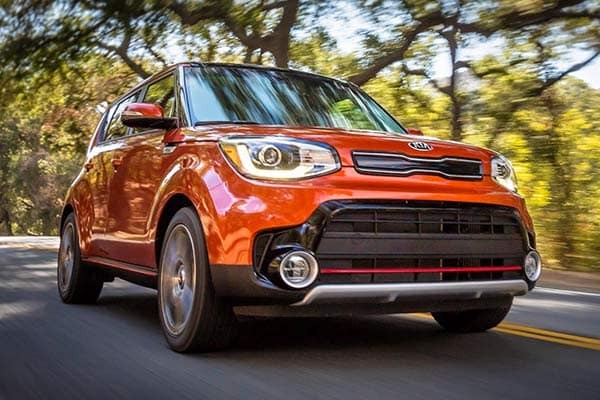 From the signature Kia reverse-bowtie, blacked-out grille to the generous cargo room and everything in between, the Kia Soul is truly a finely crafted small SUV. After you’ve shopped our inventory of the new Kia Soul at Kendall Kia, be sure to call or contact us online if you have any questions. Our friendly and professional team is ready to guide you through the buying process. Visit our Kia Finance Center and we’ll help you find the right finance option to meet your lifestyle and budget. We’ll also take care of your current vehicle by providing you with a fair trade-in value. It really is that simple! Say hello to the Kia Soul in person and take it out for a test drive today by visiting our Kendall showroom. We are conveniently located at 15700 Idaho Center Blvd Nampa, Idaho 83687, just a short drive from Boise, Meridian, and Kuna. The Kia Soul comes with a 2.0L four-cylinder engine with an intelligent variable transmission for smooth shifting that turns every drive into a joy ride. The Kia Soul GT-Line kicks things up a notch with 1.6L four-cylinder engine with Turbocharger and a 7-speed dual-clutch transmission. Front-wheel drive comes in handy when Idaho roads get bad. The Kia Soul doesn’t take safety lightly with a suite of safety features with Kia Drive Wise. Kia’s innovative safety features like Forward Collision-Avoidance Assist (FCA) uses radar to help detect a potential collision and automatically applies the brakes for you. Other active safety technology functions help avoid trouble before it arises with systems like Brake Assist System (BAS) and Traction Control System (TCS). Kia wants to make sure you and your passengers safely reach your destination every time. Stay out of the cold with the Kia Soul’s remote keyless entry and push-button start. Once inside, keep your eyes and hands on the steering wheel thanks to the audio and cruise controls mounted at your fingertips. Turn your Kia Soul into a party on wheels with the available 10-speaker Harman Kardon® premium audio system. Bluetooth wireless data link provides a hands-free calling experience, allowing you to focus on the road ahead. For exceptional value and a fun driving experience every time you get behind the wheel, say hello to the new Kia Soul!